I had an idea brewing for a large tiger painting, so I did this quick little 20” square sketch of a painting. After I painted the eyes, I became loose and playful with the acrylics. Using two pairs of complementary colors added visual impact. Tigers are intense predators, but gentle and playful among their family members. My intention was for the painting to carry the spirit of tiger. To my surprise, I sold this piece before I had even cleaned my brushes. That undoubtedly means I should soon paint the large version I see in mind’s eye! 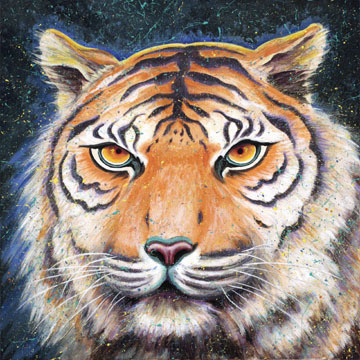 This entry was posted in Art Paintings and tagged acrylic painting, tiger, tiger painting, tiger spirit on December 5, 2010 by Lexi Sundell. Neat page, Carry on the excellent job. Thanks a ton!.